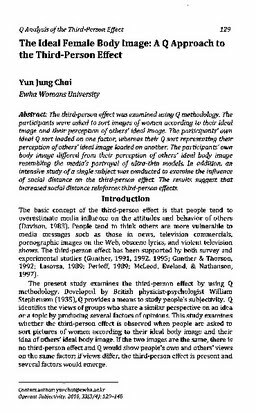 The third-person effect was examined using Q methodology. The participants were asked to sort images of women according to their ideal image and their perception of others' ideal image. The participants' own ideal Q sort loaded on one factor, whereas their Q sort representing their perception of others' ideal image loaded on another. The participants' own body image differed from their perception of others' ideal body image resembling the media's portrayal of ultra-thin models. In addition, an intensive study of a single subject was conducted to examine the influence of social distance on the third-person effect. The results suggest that increased social distance reinforces third-person effects.